Fifteen and Upstream pictured as winners of social enterprise photography competition. The winners of a striking photography competition which highlights the breadth and positive impact that social enterprises can achieve have been announced today. 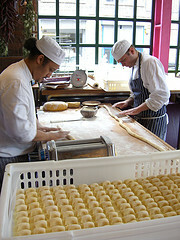 From old ladies enjoying African drumming to young people from disadvantaged backgrounds rolling gnocchi in Jamie Oliver inspired restaurant Fifteen, the photographs bring to life social enterprise in the UK on a day dedicated to the sector as part of Enterprise Week. The awards held by the Social Enterprise Coalition were presented by Kevin Brennan, minister for the Third Sector and judged by the Coalition’s social enterprise ambassadors. 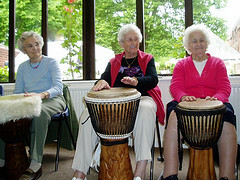 The winning photo of silver-haired African drumming was taken by a staff mentor at Upstream, a Devon social enterprise that aims to overcome social exclusion among older people in rural communities. The ladies pictured include a former local teacher, a farmer and a former pub landlady. The award highlights the huge value of a stimulating and creative approach to genuine social enterprise, in which people take control of their own health and happiness, and in which local solutions are seen to be the answer in tackling much wider issues. The runner-up photo was taken by David Kapay a former sous-chef at Fifteen London. Both photographs will be featured in the next edition of the Big Issue and will also take their place as gallery exhibits in January at London’s Contemporary Urban Centre.